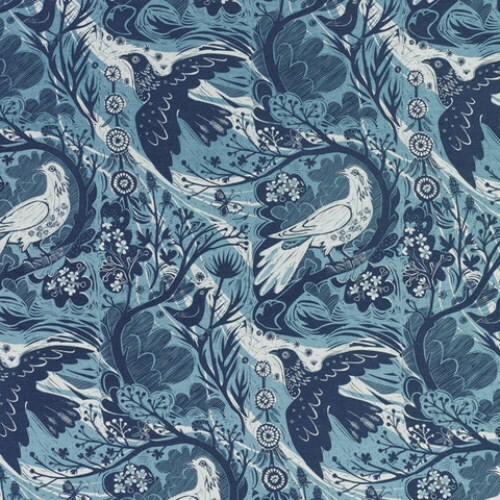 I discovered St. Jude’s through their lovely blog All Things Considered, and was immediately struck by the designs that come from a wide range of artists and are available as fabrics or as prints. Many of the designs and prints take inspiration from landscape and the natural world, and there is something about them that gives me a feeling of certain places I have known. Maybe it is just the style of some of the artists, and I cannot put my finger on it, but this feeling is certainly there and I have to admit that just flicking through the website left me a little homesick. We felt there had to be a better way to design and make interesting fabrics, so we decided to set up St. Jude’s. We started with the rather unambitious aim of producing two of Angie’s designs and taking it from there. Since then St. Jude’s has become a small but thriving business, and we’ve had the pleasure of working with a number of artists, makers and printers we admire. Our personal sensibilities and interests are often the starting point for a piece, but the artists we work with then bring their own approach to imagery, colour, pattern, shape, line and so on. A finished design will emerge from a process of sharing references and ideas. Pots of tea are often involved. You can read more about their concept and philosophy on the about us page of their fabrics website, and learn more about the artists they work with here. Readers in Herefordshire should definitely check out the next St. Jude’s exhibition at Tinsmiths in Ledbury in March, featuring fabrics plus prints, collages and paintings from the different artists who work with St. Jude’s, including Ed Kluz, Angie Lewin, Merk Hearld, Emily Sutton and many more. This entry was posted in Art, Craft, We like... on February 2, 2012 by Paul Scraton.